The summer issue of Paris Transatlantic is now available, which includes an edited version of my review of the recent Annette Krebs/Taku Unami release, motubachii. I am providing a link to PT, as there is a lot of good reading to be found in this issue. I am posting here the pre-edited version of my motubachii piece, as it includes, in its additional 240 words, a few references I think further clarify my regard for the release. 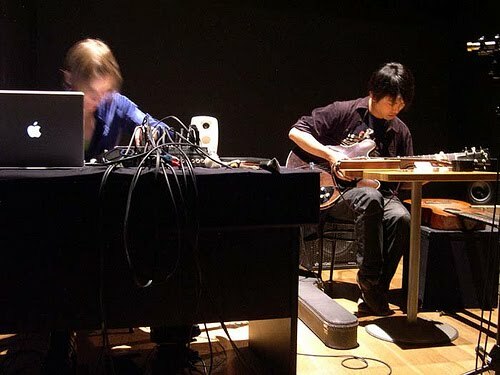 It is the how of motubachii, Krebs and Unami’s first release as a duo, strange fruit culled from a series of recordings made last year in Germany and Japan, around which the online discussions I have seen coalesce. It is indeed a “puzzle box of sound,” as producer Jon Abbey has it in his press release. It is understandable that even seasoned listeners to radical, leading-edge music might attempt to solve the mysteries of such a disjunctive, ambiguous and, without intending this to be in the least bit pejorative, initially unmusical sounding work. Such ambiguities, disjunctions and even, one could argue, negations make a lot of listeners uncomfortable. Motubachii, at first blush, seems to proceed without flow, logical transitions or even much regard for the musicality of many of its sound sources. The threads that are perceptible, revealing this 53 minute sonic diary to be quite coherent, and eventually disclosing some of its baffling structure, are several. One is Krebs’ recurring guitar/mixing board/samples, a clear lexicon of sound treatments, tolling tones and bell sounds, trebly string plucks and sonorous low tones, cycling throughout the constantly shifting locations and ambiences. Another is the paradox of Unami’s orchestrated panoply of slammed doors, sporadic hand-claps, tossed coins, bursts of hissing pipes, dragged furniture, manipulated cardboard boxes and something sounding like banjo plinks- for this listener, sounding random and tossed off for many [many!] listens- while actually every bit as arranged and intentional as Kreb’s relatively more conventional plectrum-sounds and samples [some of these latter familiar from her other recent duo releases, the excellent Falter I-V, with Ernst Karel, and the Kravis Rhonn Project, with Rhodri Davies]. And yet another thread is repetition, suggestive of a sort of circular travel from the first to the seventh and last track. [The first and last track are , in fact, identical, though the last reiteration enigmatically contains two additional seconds]. For reasons I may or may not manage to articulate, motubachii has, from the jump, sounded to me like a sound diary of the duo’s month or so together. The over-arching, kaleidoscopic structure is episodic, the duo’s music placed within continually shifting contexts of spaces and ambiences – various rooms, public commons, and both subtly and jarringly-edited inside/outside locations. The entire work is shot through with sounds that evoke transience, travel and impermanence- passing traffic, intrusive radio bursts, out-of-the-frame conversations, snapped-off phrases, truncated folk music-and, woven throughout, Krebs and Unami’s own unlocatable, unfixable sounds. Repetition provides at least an illusory form, even as the duo shuffle and shamble through their shared journey, twinned tricksters upending any toe-hold you manage to gain for a moment along the way. Most of the elements of motubachii are established in the terrific, opening five minute section-and, as I said, returned to at its conclusion. Initially, no doubt in my own reflexive attempt to establish some sort of analogy, I thought of Takemitsu’s work in the Kobayashi film, Kwaidan. Spare percussion, struck strings, collages of captured voices-there is some resonance with Takemitsu’s startling early electro-acoustic work. Then the idea of a sonic diary took hold, and I cannot shake it. Sound phenomenon is turned inside out, dislocation and jarring segues are motubachii’s constant element. This is the sound of cognition traveling through the shopworn, well-trodden, banal and intimately familiar landscapes we inhabit. All the sounds that impinge- bursts of media, baby laughter, plangent construction sounds-interlaced with Krebs’ soft and swelling notes and tones. Indulging for a moment in my own speculation as to how motubachii was put together, I would not be in the least surprised to learn Unami and Krebs stitched their respective contributions together in post-production, in parallel play, complementary conjurers, the two delighting in being the archetypal Reynards of sound. I must mention the tri-fold package design by Yuko Zama, an apposite visual counterpart to the sounds within. Readers familiar with the Erstwhile catalogue know that Ms. Zama’s design work has emerged as an essential element of Erstwhile’s releases, and I am happy to have a forum in which to praise her work. Whatever the how of motubachii is revealed to be, let this salience not be lost here- the force of its imagining, stopping the mind for reasons other than the mystery of its construction. While you can hear unmistakable elements in both Unami and Krebs’ sound choices in prior works, I am hard-pressed to imagine whom else could have created an experience quite like motubachii. It is, to lift a descriptor from Stanislaw Lem’s The Star Diaries, which I am told both musicians enjoyed, “absolutely necessary and altogether impossible”. There is that persistent, but spectral sense that you are hearing an account or documentation of their joined imaginations, and that they have traveled together through time, returning and bearing the strange fruit of motubachii. It is unlike anything else you’ve heard in the Erstwhile catalogue, or elsewhere, and I am confident I have not heard everything there is to be heard from these kindred spirits, whether by revisiting motubachii, or in their future projects. This entry was posted in music writing on July 14, 2010 by jessewgoin.